Knife gate valves are one of the important types of valves used in various industries. These valves are equipped with a blade, which can easily cut heavy liquids that have a tendency to clog the pipelines. This is why these valves are largely employed in erosive, corrosive, and abrasive environments. Originally, these valves were employed in the pulp and paper industry, today, they are used in various industries. How does a knife gate valve operate? Where are these valves used? This post aims to answer these questions in detail. Due to their typical design and construction, these valves have become a part of applications, which involve stubborn greases, varnishes, heavy oils, wastewater, paper pulp, viscous fluids, and slurries. Knife valves feature a seal made of elastomer, which accommodates the blade, once it ensures the passage of liquids after cutting them. It is seen that thick liquids can easily glide through the soft seals without an obstacle. However, if a powder or solid mass is forced through the gate, it may pack the soft seal from both ends, thereby damaging it. In such cases, quick seal replacement becomes the only option. These valves are designed in larger sizes than the regular gate valves to handle heavy fluids. When the fluid is made to pass through a partially open gate, there is a high risk of valve damage. As a liquid is forced through a gate, it produces high vibrations, which may erode the seat and disk. In short, these valves are not recommended for applications, where the gates are not fully opened. 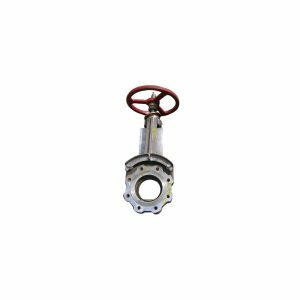 In addition to the above-mentioned applications, these valves are also employed in underground installations, chamber installations, sewage and water systems, drinking water applications, etc. Do you belong to any of the above-mentioned industries? If yes, you might already know how important it is to invest in the high-quality knife gate valves. It is not always necessary that you opt for new ones only, you can even consider good quality used valves. There are many distributors, who offer these valves in various specifications to suit your requirement. J&M Industrial is one of the leading providers of the highest-quality used and unused knife gate valves. The company stocks a large inventory of these valves, and assures one of the fastest lead times in the industry.